The founder Chairman of LAUGFS Holdings, W.K.H. Wegapitiya, was honoured with the Deshabandu title at the recently concluded National Honours 2017 Ceremony. 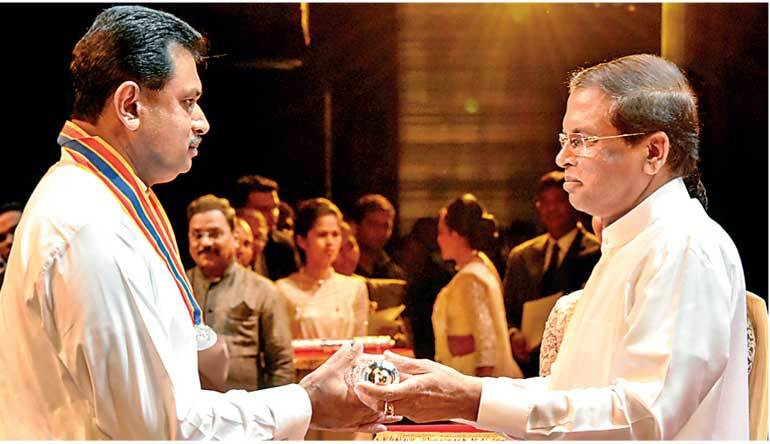 The event, which was held at the Nelum Pokuna Theatre, bestowed honours on select distinguished Sri Lankans, for their outstanding contributions to the advancement of the nation. The ceremonious proceedings, which were held under the patronage of President Maithripala Sirisena, was marked by a large gathering to celebrate these distinguished honours conferred to extraordinary individuals from various fields. The Deshabandu title is bestowed in recognition of a distinguished service of a meritorious nature to Sri Lanka, and is an extremely rare lifetime national honour, held by not more than 150 living title holders at any given time. It is conferred with a citation and a Silver Medal with a symbol of a peacock, and is a highly prestigious honour to receive during the lifetime of a Sri Lankan. This year’s National Honours ceremony was held after 12 years, and only 89 outstanding individuals were honoured at the ceremony. Wegapitiya is known for leading the rapid growth of LAUGFS within a mere 22 years, to build a diversified conglomerate that embodies a truly Sri Lankan identity. The pioneering auto gas business, which marked the inception of LAUGFS in 1995, has expanded rapidly over the years stretching out to diverse sectors, from power and energy, and consumer retail, to leisure and logistics, with a strong overseas presence under his leadership. His entrepreneurial spirit and pioneering vision have helped mould LAUGFS’s journey and its culture of innovation and leadership. His patriotic nature and strong determination to build a truly Sri Lankan conglomerate has today resulted in LAUGFS’s overseas expansion, enabling it to imprint the Sri Lankan flag on the global map with true nationalistic pride. His Sri Lankan spirit, together with a strong set of values and work ethics have helped define LAUGFS’s commitment towards developing sustainable communities through enhanced livelihood and employment creation, building strong local industries through technology and innovation leadership and supporting the advancement of Sri Lanka through its contribution to economic, social and environmental progression. His entrepreneurial achievements and contribution to the nation have been recognised both locally and internationally with numerous awards and accolades, including the National Gold Award for Entrepreneurship, the prestigious Entrepreneur of the Year Platinum Award, the Asian Leadership for Excellence in Entrepreneurship Award, as well as the Ada Derana Sri Lankan Entrepreneur of the Year 2016 Award. An influential speaker, Wegapitiya is an eminent guest speaker at many national level and international forums in entrepreneurship and business leadership. His humble beginnings, the ability to withstand adversity with persistence and courage, and his strong desire to transcend the ordinary have inspired many entrepreneurs across the country. An undergraduate of University of Jayewardenepura, he is an MBA holder from Post Graduate Institute of Management (PIM). He has also studied Energy Management at the Oxford University of the UK, and is presently reading for his PhD at PIM. Wegapitiya has served on the Boards of several prominent organisations in Sri Lanka, including Mobitel Ltd., and presently serves as a Board Director for Sri Lanka Telecom PLC, while also being a member of the Executive Council of Ceylon Chamber of Commerce and National Pay Commission and Governing Council of the University of Sri Jayewardenepura. Wegapitiya is a past Chairman of the Chamber of Young Lankan Entrepreneurs and a former Senior Vice president of the Federation of Chambers of Commerce and Industry (FCCISL).